What makes a beautiful liturgy? The music, the preaching, the architecture, the people? Much ink has been spilt, music composed and many churches re-ordered in the name of restoring or creating beauty. Let us return to the central act of the Christian faith: the last supper. On the night before he gave himself up, Christ showed his love for us all by giving thanks to God, and offering himself through his body and blood to us all. This selfless act took place against the background of his preaching, healing and evangelising ministry and with the knowledge of the dreadful acts to come. The selfless act of Jesus is the paschal mystery of love. In our liturgy Christ himself becomes the gesture of the church. As liturgical musicians our role is to enable the beauty of Christ to shine forth in the liturgy. Does the music we choose, lead and sing express the paschal mystery of love? Does it convey the message of Christ to the gathered community? Our Sunday celebrations are not merely a remembrance of a past event, but an actualisation of the Church of God in a particular time and place. We carry out this celebration through a ritual act we call the liturgy. Just as Jesus did in the Last Supper, we follow an order. Our liturgical order is the space through which Christ imbues us with his love. We must guard against trivialising the power of ritual, introducing new fads or gimmicks, but rather allow the gathered community to experience Christ in all his beauty on their own terms. The beauty of liturgy is not fully perceptible through a single experience. Rather, like a rubbing away at a precious metal we seek to uncover the riches which Christ has revealed through his death and resurrection. We know we have experienced a beautiful liturgy when our words and actions are imbued by the love of Christ. The liturgy is not an optional extra in our lives, or something aside from it, but rather the ‘source and summit.’ The beauty we experience in the liturgy guides our interpersonal relationships, our thinking and our actions. Liturgical beauty, therefore, is not for its own sake, but rather it is to imbue each of us as disciples of Christ. We cannot (or should not) dictate how we receive this beauty, but rather we must surrender ourselves to the possibility of the pneumatological encounter. At each liturgical celebration through our music we should strive to allow the paschal love of Jesus Christ to radiate. We must allow the music to speak in ways we cannot comprehend. We must allow the gathered community the time, space, silence and detachment from themselves so that the music may speak to us all of the love of God, through his son Jesus Christ. Have you ever been headhunted for a job – offered a salary, benefits, hours of your own choosing? And even if you didn’t seem interested the employer kept offering you better terms. No? Me neither! But this is what God is offering us today! He is offering us a life changing package with great benefits. God’s offer is all about love – he offers us his unconditional love, and in return ask for our love. Unlike a job offer, there are actually no pitfalls to God’s offer! Many however have chosen not to take into their hearts the reciprocal love of God. This is where mercy comes in: mercy changes everything! Rather than giving up, God continues, day in day out, to offer offer us this unconditional love. God sent his only Son to the earth to prove that he was deadly serious about his offer. We speak of ‘Good’ Friday and not ‘Bad’ Friday, because by dying on the Cross Jesus carried the sin of the world: an act of merciful love beyond comparison. Hate is the direct opposite of mercy. Christ’s Church is not, and must not be allowed to be, a religion of hatred. Yes, rules and doctrines are important. But they serve to allow us to more clearly encounter and accept the merciful love of God. In order to make this more clear, Pope Francis has proclaimed 2016 as the Year of Mercy, specifically promoting two encounters: Firstly, the opportunity to pass through a holy door and secondly, through the sacrament of confession. In both of these encounters we are offered abundant mercy, unconditional love and total forgiveness. Where as a prospective employer will likely get tired of waiting for you to accept their generous offer, God in his generous mercy, does not. The role of the Church today is to act as a conduit of God’s mercy, constantly inviting people to experience the merciful love of God. Have you noticed how much we do looking towards the future? We save money for holidays, new cars, to pay the bills. We buy our shopping for the week ahead. All of these decisions are of course made in the present, and we reserve the right to change our decisions, or our reasons for those decisions on a daily basis. As a musician (or as I have discovered, as a runner!) one can spend many days/ weeks/ months working towards one big event, be that a concert or race. The big day arrives and all the preparation pays off. We bask in the glory and rejoice in the success. But then what? Often we feel deflated, unsure of the point anymore. But usually, with a short period of time some new aim piques our interest and we once again have a focal point. On a daily basis I am privileged to work with Cathedral choristers. Rehearsing and performing for up to three hours each day, five days a week means that we see a lot of each other and sing a lot of music! Motivation of a group such as this takes on a different slant to one’s individual motivation. In the the case of the team, one has to (subconsciously or otherwise) surrender one’s own motivational aims to the good of the communal goal. I often recall to the boy choristers the story of Sir Alex Ferguson’s time in charge of Manchester United (nb. As an Everton fan I have no special love for Manchester United, but the example is very clear!) What was the motivation that kept Sir Alex and his players going day after day, win after win, season after season in what has been clearly the most successful premier league management of the last twenty years. I suspect the answer was twofold. A desire to win, and a desire to be better the next days than the day before. The point I make to the boy choristers is that I am sure that when Manchester United won a game that Sir Alex would focus not on how good they were today, but one what they needed to do to be better the next day. What these examples I have outlined all have in common is a focus on the future, which guides us in how we should live the present. None of these examples however really has an ultimate ending. Holidays come and go. Football managers and teams come and go. There can be no ultimate end. Many of our liturgical and eucharistic texts exhibit similar eschatological traits. However, I would argue that much of our liturgical practice over emphasises the rational, here and now aspects of our celebration. Liturgical music, both in its texts and its musical compositions particularly demonstrate this. There is a danger that our worship today is self enclosed and not orientated towards the future promise of eternal life. Today we are just as likely to experience a liturgy that is primarily influenced by the local culture and political trends. The primary culture of the liturgy is the paschal mystery – the reality that Jesus Christ died and rose again so that we may have eternal life. Like a team sport or activity, the liturgy is a communal activity. We must surrender our own wants and desires to the will of Christ and his Church, to receive the gift of Divine love and offer in return our lives to the Glory of God. All of the examples I have highlighted are focussed towards the future: each is inwardly and outwardly motivated and drawn towards their ultimate culmination (whether that be a cup final, a concert, the end of time) but equally exists in the here and now, and therefore draws inspiration from the future hopes to motivate itself in the present. In the examples highlighted earlier of choristers, runners, footballers the future aim (be it a concert, race, final) is in reality only a medium term goal. Once achieved a ‘post event’ blues can develop. The finite end ordinarily would not occur with death, but earlier. We retire as a footballer/ athlete or we take time out as a chorister once our voice changes. The future life promised by Christ through his Church however is the ultimate. It lies on the other side of death. It is both our long term goal and our present reality. It motivates us to live a Christian life, sure in the certain hope of eternal life. Being a Christian is not a choice, but a way of life. We are called, but we must respond and choose to follow. Our role is to prepare for the coming of God’s Kingdom here on earth, a role that does not allow for post-event blues. It is the promise of eternal life that differentiates the Church from my earlier examples. The path is not a simple one, but like the manager of a football team, or athletics coach, we have someone looking over our shoulder encouraging us and orientating us to the end game. Lets not loose sight of the future! Our lives may be seen as a journey. A journey to the promised reward of the heavenly kingdom. The liturgy that we celebrate Sunday by Sunday, day by day, is in itself a rehearsal for that day when we will join with the whole company of heaven in the praise of God. It might seem strange to suggest that our liturgies are a rehearsal. We come together as a community, both those present, those gathered in other locations and those who have gone before us, to join together as one body in the praise and worship of our God. In the liturgy we learn of the experiences of our forefathers, we relate the sacrifice of Christ to our lives today and we look forward to our participation in the eternal banquet. The music that we liturgical musicians provide assists people on their journey, and more than that, provides a sense of direction. Indeed, St Thomas also said that is it ‘Through the praise of God man ascends to God.’ There can be no greater privilege for us to lead others on this journey and bring them closer to the merciful love of God. Planning a conference off the beaten track can be a risky experience. However, it is often when we take risks that special things happen as a result. This weekends CCDM (Conference of Catholic Directors of Music) conference in Buckfast Abbey was such an occasion. Delegates travelled from across the country to the South West to experience culture, beauty, conversation and Buckfast tonic wine (more on that later!) A key feature of this conference was the opportunity, due to the financial generosity of the Abbot, for delegates to arrive on Friday and for the conference to take place over two days. This allowed members to have the opportunity to have more informal conversations, a vital part of any human interaction. The weekend began with a tour of the distillery on the Abbey grounds where Buckfast tonic wine is made. Delegates were given the opportunity to sample the wine and to discover how it is made. The tour was followed by the Conference dinner at which the Abbot of Buckfast, the Rt Rev David Charlesworth welcomed us and shared a little of the history of Buckfast Abbey. At 9pm all delegates made the short walk to the Abbey church for the final service of the day, Compline, which was chanted by the monks in darkness. Saturday began with a tour of the abbey grounds prior to the first session of the day led by the local ordinary, the Rt Rev Mark O’Toole, Bishop of Plymouth. Bishop O’Toole had clearly gone to some trouble to prepare an address that would both educate and challenge the delegates. Speaking broadly about the role of liturgical music in our liturgies today, and more specifically on the importance of the the musical training of seminarians the Bishop highlighted the importance of liturgical music and the priorities which need to be placed on it. The conference was ably hosted by the Abbey Director of Music, Philip Arkwright. His organisational skills allowed the weekend to flow without interruption and his musical skills were evident in the high standard of singing by the Abbey Choir at Vespers. In his presentation on the musical life at Buckfast, Philip shared with us the exciting plans for a new organ which is to installed in the Abbey Church prior to 2018, when the community will celebrate a thousand years of christian witness and worship on the site. After lunch we were treated to a brief talk by Dom Sebastian Wolff FRCO, a monk of the Abbey and noted composer. He spoke of the changing requirements for liturgical composers in the church and the influences that had shaped his own compositions. During his time at the abbey (some 66 years if I recall correctly!) he has written a wide variety of music for congregations, choirs and organists much of which is available for purchase from the Abbey shop. The final session of the weekend was delivered by Dr John Milsom, visiting professor in Musicology at Liverpool Hope University. Dr Milsom questioned the delegates about how they chose and utilised various sorts of music in their liturgies before demonstrating how composers of liturgical music in the renaissance period had equally composed music with an awareness of the context in which it would be used. As musicians and liturgical practitioners we can very much get to used to doing things ‘as we like them’, or ‘as we have always done them’. Dr Milsom’s session however forced people to sit up and start asking questions they might not have previously considered, leading them to reconsider previously held assumptions. The weekend concluded in the Abbey Church with the singing of First Vespers of the Sixth Sunday of Easter led by the Abbey Choir directed by Philip Arkwright and ably accompanied on the organ by Organ Scholar Philip Broadhouse. Congregational participation was strong in the singing of the psalms, and the choir illuminated the liturgy with motets by Matthew Martin and Colin Mawby and the service concluded with an organ voluntary composed by Dom Sebastian Wolff. As stated at the outset of this report holding a conference in a secluded location such as Buckfast was a risk. However, it was clearly a risk worth taking. The location provided an excellent backdrop to the conference with first class facilities and excellent organisation. We received true Benedictine hospitality and I am sure, all came away feeling renewed from our interactions with fellow members and speakers. Thanks are due to all our speakers, to Philip Arkwright for carrying out all the onsite organisation, the Abbot of Buckfast for his very generous hospitality and welcome and the CCDM committee for the hard work over the last year of preparing for this conference. Finally, the conference exists for the benefit of its membership. It was heartening to see so many members attend this conference. It is my hope that, buoyed by this experience, members will make a concerted effort to attend future conferences starting with St Chad’s Cathedral, Birmingham on Saturday 7th May 2016. I look forward to seeing you then. 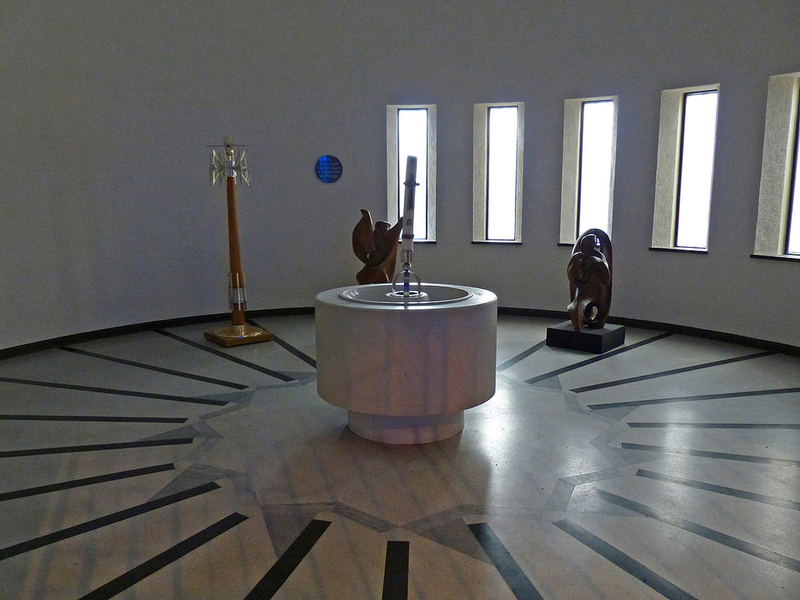 This is the final blog posting in a series of 6 focussing on the architecture of Liverpool Metropolitan Cathedral. In this posting I will consider the placement of the organ and choir, before offering some general thoughts and conclusions to the series of blog posts. 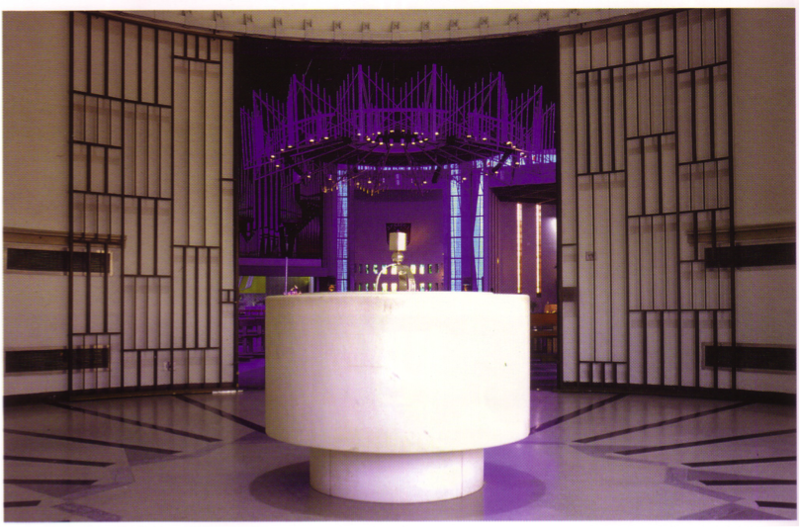 The architect, Frederick Gibberd placed the choir behind the altar. 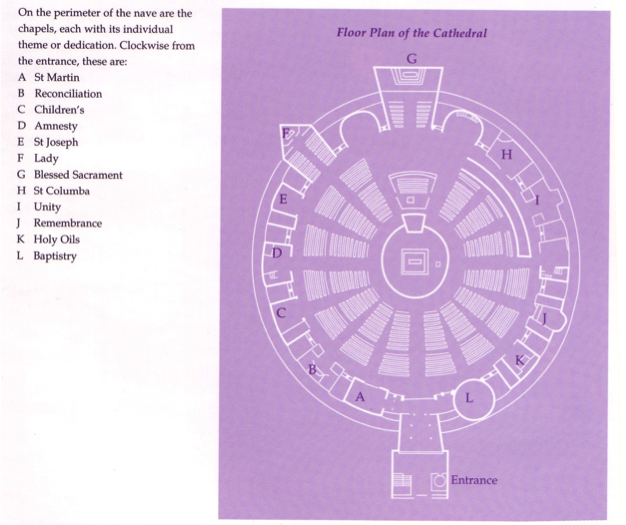 This placement both allowed the choir to be part of the liturgical ministries and ensured the continuity of the circular shape, whilst not running the risk of disenfranchising members of the congregation. The positioning of the organ was a functional requirement, in that it needed to be placed in a position from which it could speak freely into the space of the Cathedral. Naturally then, the choir was placed directly in front of the organ pipes so that all musical leadership is provided form the same place. Whilst this was a suitable arrangement for Mass, it was not at all effective for the choral celebration of the Liturgy of the Hours, in particular sung Vespers. Experimentation led to the choir enclosure being removed, and choir stalls influenced by Anglican Cathedrals being placed in front of the organ case. 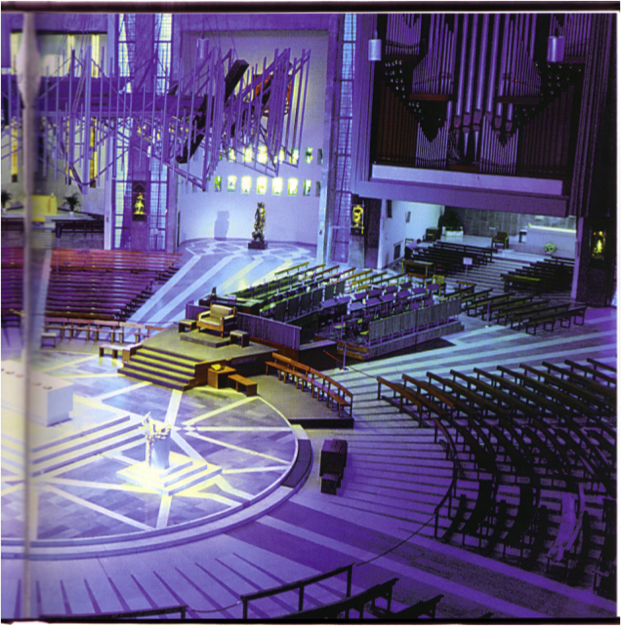 One wonders, had the Metropolitan Cathedral been built a decade later that it actually was, would it have been a different building with new liturgical principals? Whilst the placing of the altar in the midst of the people was a bold and innovative move, it does somewhat preclude adapting the building today. Whilst its usage for large diocesan occasions is obvious, does it serve smaller scale gatherings as effectively? One suspect that the members of the cathedral committee, and to a lesser extent, Archbishop Heenan, should be credited with the innovative liturgical design, and the decision to not place certain permanent items as the ambo and cathedra. Medieval cathedrals often illustrated the power and wealth of a city, displaying monumentality in both conception and material. However, these buildings rarely were/ are useful in a liturgical sense. 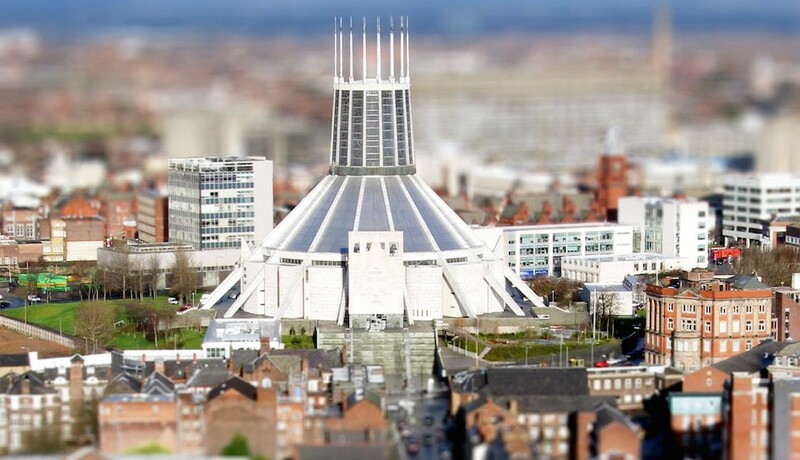 Liverpool however should be proud, in possessing a Cathedral that illustrates both stature and beauty, sitting prominently on the skyline, whilst at the same time fulfilling a truly liturgical role as the center of Roman Catholic worship in the north of England. 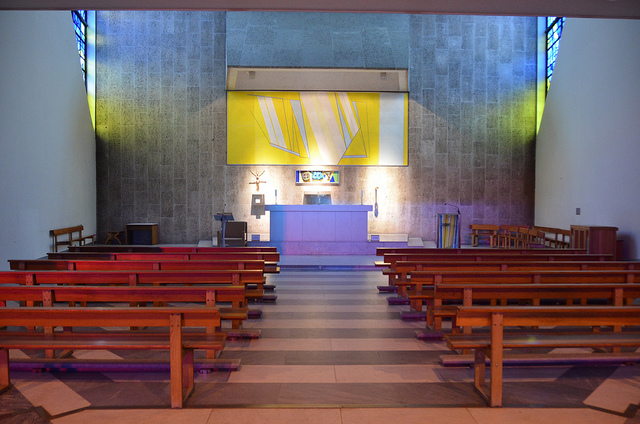 This fourth blog posting on the architecture of Liverpool Metropolitan Cathedral focuses on the cathedra – the bishop’s chair. 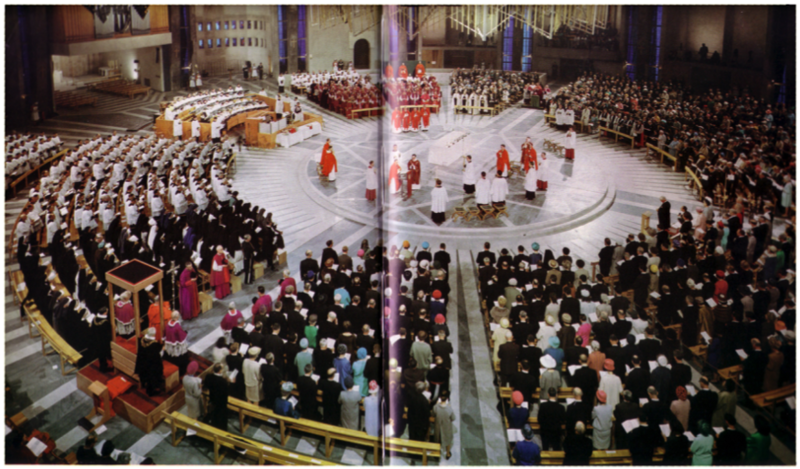 It must be remembered that the documents of Vatican II which have subsequently guided the placement and role of the bishop’s chair were not available to Gibberd or the cathedral committee at the time of building. At the committee’s request, the cathedra was designed to be portable so that through experimentation, the best place for it might be found over time. Following the Eastern tradition described above, the cathedra was placed in the nave at the Mass of consecration: however this was not found to be a permanent solution, in part I would suggest, because of the realities of concelebration and the fact that in a circular building, it would be difficult to hear speech coming from within one of the aisles, as well as the fact that part of the congregation had their backs to the Archbishop! 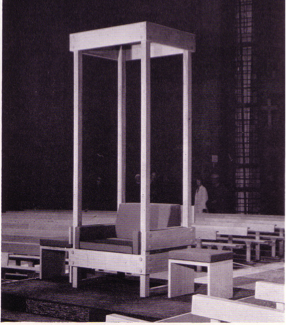 The cathedra as it was originally designed by R.D. Russell is a wooden structure, elevated on 3-step dais and covered by a canopy. 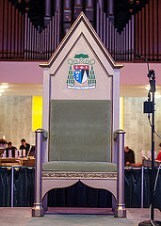 At the installation of Archbishop McMahon OP as the ninth Archbishop and Metropolitan, the Cathedra used by previous Archbishops was replaced by a new cathedra bearing the Archbishop McMahon’s coat of arms.